I hate games that go well for me yet are miserable for everyone else on my team. This was one of those games. It makes it very difficult to snowball a game when I am stuck playing mid but bottom and top both keep dying. When I would try to gank for bot Kennen would just zip away and when I went top Jayce died for free in a three-man dive on Garen. Jayce, just step out, no need to tank turret! That’s what your two team mates are for! Kennen knew I was trouble, and I knew that Kennen was going to be a problem. Kennen acknowledged this in the game and said “gj Malz” one time after I caught him and killed him. “You can carry this game” is all that he said after that. I wasn’t quite sure. Jayce was way behind to the point that he was just about useless. Bot lane had fed Kennen to the point that he could just press R and be immune to me because I would be forced to run away. Luckily, AD Kennen has to pick his targets, he can’t melt a full team like AP Kennen does with his ultimate and his burst damage. As this game went longer I started getting closer to a finished build. I was very fed. Malefic Visions has this way of picking up kills because of how it ticks. I didn’t mind. I loved having the gold. Better me than Jayce in this game. 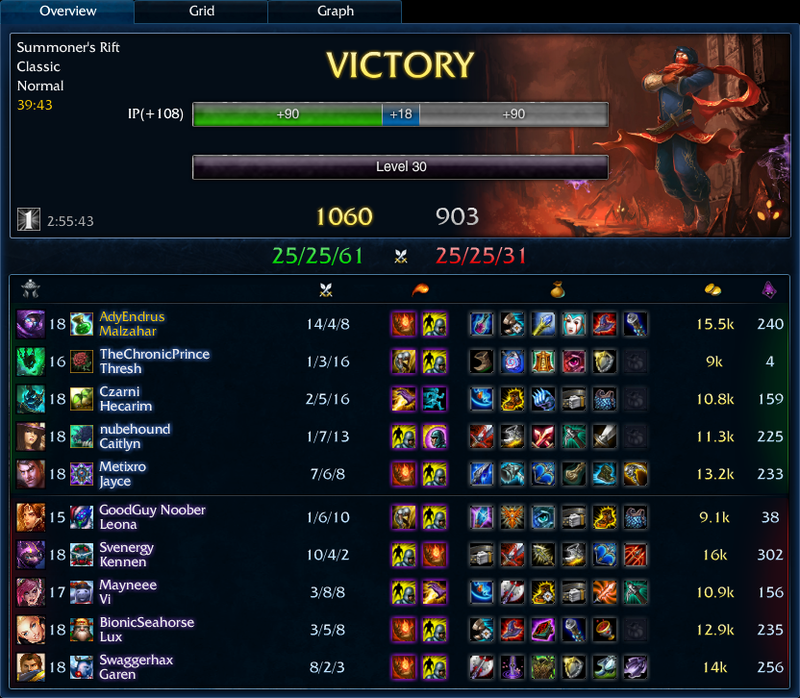 I knew that if I could just get ahold of that silly rat Kennen I could win this game. We had won a small team fight that gave us the advantage we needed to push up and take a tower. We were still clawing our way back from being behind this enemy team. They were down a man or two which meant that we would probably get the inhibitor for free. I let my team know that I was going to grab Kennen the first chance that I got. My opportunity came so I Flashed in and grabbed Kennen with Nether Grasp. His health bar was melting at an intense rate. Hecarim ulted to close the gap and get on Kennen and disrupted Vi and Garen’s attempts to stop my channel. Kennen was dead, the inhibitor was down, and the game was too late to salvage. The enemy team had no way to battle my Rylai’s slow and the sheer damage output of being down their most fed carry. Even though the game was a tie, in this case the tie goes to the prophet!